The Nikon Coolpix S51c has a sleek two-tone body that includes an IEEE 802.11b/g chip set with which to upload its eight megapixel images to the company's "my Picturetown" photo sharing site, or send them via email. The Coolpix S51c has plenty of other attractions on top of this standout feature, as well. There's a prism-folded Nikkor-branded 3x optical zoom lens, a whopping 3.0-inch LCD display with 230,000 pixels, plus a few clever technologies besides. "D-Lighting" is an exposure correction technology, and is combined with a face-priority AF function (capable of detecting up to five faces in a frame), an in-camera red-eye fix function -- the three working together at a press of the One-Touch Portrait button to capture the best possible portrait image. The Nikon S51c also offers optical image stabilization, and the camera saves images on Secure Digital cards, or in a not-so-generous 13MB of internal memory. 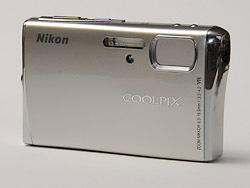 The camera includes USB 2.0 Hi-Speed and video output technology. Other features include a built-in flash strobe, a macro mode that focuses to 1.6 inches, and power from a lithium-ion battery. 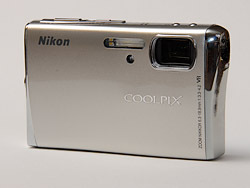 The Nikon Coolpix S51c ships in the USA from September 2007 priced at about US$330. Intro. We hadn't quite recovered from the indigestion of reviewing the Coolpix S50c when the S51c showed up on our plate. The difference between the two is a jump from 7.2 megapixel to 8.1, and a $20 decrease in price. The Wave. The chrome bulge is the WiFi. Snap Shut. Ready to travel. While the Nikon S51c includes Nikon's D-Lighing, face priority autofocus, in-camera red-eye fix, the big draw is its WiFi capability. But like the Nikon S50c before it, the S51c only transmits to Nikon's server, now called my Picturetown (not Coolpix Connect), but still operated by Fotonation. Why pay more for WiFi if you can't wirelessly upload images to your own computer? If you have the answer to that $80 question, this may be the camera for you. But having enjoyed more versatile WiFi from prior Nikon Coolpixes and Kodak EasyShare cameras, I can't in good conscience recommend this scheme. Hamburger without the patty, I called the S50c. The Nikon S51c might charitably be called a cheeseburger without the patty, but these Nikons still don't have any beef. Look and Feel. The Nikon S51c is stylish. There's something classically elegant about the Wave design and it probably seduces a great many credit cards to slip out of their wallets and purses. It may have nothing to do with being a classic design, but the S51c and S50c are identical. Rear View. The LCD dominates. The body is identical to the S50c. The grip is on the thin side of the Nikon S51c rather than the bulge where the folding lens resides. That encourages new users to make the mistake of using two hands to steady the camera. It's just too easy to let a lazy finger or two droop over the lens in the upper corner. You can -- and should -- shoot with just one hand on the Coolpix S51c. If you really want to use two, restrict the left hand to supporting the bottom of the camera. Maybe I'm getting stronger with each passing camera review, or Nikon improved the touch on the S51c's buttons. Even the zoom lever seemed more responsive to me. But that could also just be a manufacturing variation. The controls remain small but tactile, so you can find them fairly easily. Usually. Top Panel. The Power and Shutter buttons (top) are hard to find. The Face Detect and Email buttons on the other side are not. Nikon's menu system is fairly straightforward because there's just not much to it. The rotating navigator dial is a real bonus here because you can scroll with it. Press the Menu or Mode buttons and scroll with the navigator. You can get used to that pretty quickly. You can alternately use the arrow keys instead of the scroll wheel. On the S50c I found that confusing. But I must be getting smarter as well as stronger because I wasn't confused on the S51c. I just decided to scroll (partly because I was always arrowing the wrong way anyway). Life was lovelier that way. It's even lovelier, I found, to switch to icon display or the menu items rather than text display. That fits everything on the screen at once and you really don't have to give up the text, since the top line of the screen explains what each icon means. A quick press of the Telephoto end of the Zoom lever gets you a one-page text explanation of the option, too. There isn't a lot of room on the back panel for controls because the huge LCD takes up all the space. That results in some cramped controls. For example, the Flash Lamp Indicator to the right of the speaker grill on the back panel is obscured by your right thumb as you grip the camera, which also sits on top of the speaker grill (not a big deal since you don't listen to it when you are shooting). EV label. The Right arrow accesses EV but you'd never know it. Even worse, though, is that the label for the EV compensation control on the Right arrow just doesn't fit on the back panel. Where is it? On the side of the dial. For a while, I thought Nikon had abandoned EV. It wasn't in the menu system and I didn't see a label for it. Then I wondered what the Right arrow did in its spare time. Oh, EV. The Power button and Shutter button are very slim, like the top panel itself. And while they look very nice, they can be hard to find without actually looking for them. But they are slightly raised and I learned to find them rather easily in a few days. But that's a lot of learning for a point-and-shoot, it seems to me. Beautiful things, apparently, aren't very practical. Not so beautiful but still impractical is the battery door. Not only is it not improved over the S50c, but it seemed the one feature to get even worse. I had the same problem on two models. The door was just impossible to get open. I felt like I had to break the piggy bank to get at my memory card. Latchitis. It's very difficult to open the battery/memory card compartment door. To make matters even more aggravating, trying to apply downward pressure on the latch to slip it open caused not only me but several others who tried it to power the camera on. The problem is that you're supporting the camera at the opposite side, which is right where the Power button is. The trick is to hold the sides of the camera and gently slide the latch open. But, again, that's a trick you have to learn. It really shouldn't be that hard to open the latch. USB/AV Cable. Pretty ridiculous when the camera has WiFi, except that you can't use that WiFi to transmit to your own computer. No, Nikon didn't provide a compact charger with folding prongs for the S51c, either. Same brick and cord that the S50c required. And the same octopus of a USB cable, too. You will resent that USB cable every time you think of the $80 extra bucks you paid for the WiFi that you can't use to copy your images to your computer. Like the S50c, the Nikon S51c is a beauty, no question. But the rest of the package leaves a lot to be desired. Display/Viewfinder. The Nikon S51c has a pretty screen, credit where credit is due. A big 3.0-inch LCD with a healthy 230,000 pixels and five brightness settings. It's a glossy screen, though, that picks up fingerprints easily, so have a microcloth around to keep the Nikon S51c polished. I managed fine in sunlight even with the reflections, so I really didn't miss not having an optical viewfinder on the Coolpix S51c. Performance. Ah, the Achilles heel. Startup time is not nearly as onerous as it appears in our tests. You can enable Nikon's Quick Startup option in the Setup menu (and why wouldn't you?) to make it respectable. Shutdown was surprisingly quick, the lens cover snapping shut immediately. You won't feel inconvenienced turning the camera on and off to preserve battery power. Shutter lag (both combined autofocus lag and pre-focus lag) is another story. More than one story, in fact. Our test numbers suggest the Nikon S51c is average, like its predecessor. But average really doesn't cut it these days. 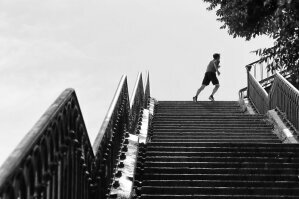 More than once, I composed my shot, pressed the Shutter button and lowered the camera only to hear the shutter go off. Shutter lag continues to plague this model. And yet (story two), sometimes the little thing just took the picture as expected. Maddening. Autofocus is the likely culprit, of course. But was it a problem just at telephoto focal lengths (zoomed in) or just confusion about finding focus at any focal length? One thing that seemed to help (along with using Sports mode) was switching Focus modes. The default is spot focus (one decision to make) but if you're pointing at the sky (or any uniform subject), that won't help. I tried scene focus mode and it seemed to help. More data, in short, helped find focus faster. Then, too, don't overlook the obvious if you've still got blurry pictures. The small Shutter button can be hard to find by feel. So naturally you tend to press too hard. It's a light touch (if you're on the button). And a hard press will just create camera shake. Shot-to-shot times were pretty good, but you have no idea what the Nikon S51c is capturing in Continuous mode. The shutter fires quickly, but you see only the last capture through the LCD rather than the live scene. So you are shooting blind. This is just opposite of the S50c, which gave you no feedback, showing the live scene continually. Seeing the live scene, so you can compose the image, is preferable. I'm sorry now that I complained about it. Our flash test shots at ISO 100 show the flash to be underpowered. In fact, the manufacturer-specified test shots use ISO 800 at wide-angle to evenly illuminate a wall 20 feet away and ISO 500 at telephoto. Bumping up the ISO (and consequently increasing noise) seems to be the new trick to housing a weak flash that recharges quickly and doesn't drain the battery. What ever happened to capacitor design? On the plus side, flash cycling takes just under seven seconds, about average. And download speed is a rapid 1,456 KB/s. WiFi. The advantage of the Nikon S51c over its sister S51 is Wireless-G capability. Wireless-G is a faster version of WiFi, which is also compatible with the slow version. It's often referred to as IEEE 802.11b/g, which means simply that it's a fast (g) device that can transmit over slow (b) connections, too. Unfortunately a fast (g) network becomes a slow (b) network whenever a slow (b) device is allowed to connect to it (yes, b can also be excluded). While it's a fast WiFi device, it's also a crippled WiFi device. It can only transmit wirelessly to one destination: Nikon's my Picturetown server. It can go through a T-Mobile Hotspot (a free six-month subscription is included), any open WiFi hotspot (like a public library) or your own WiFi network. But the files only go to my Picturetown. They can't even be routed to your computer. Nor a wireless printer. Setup. 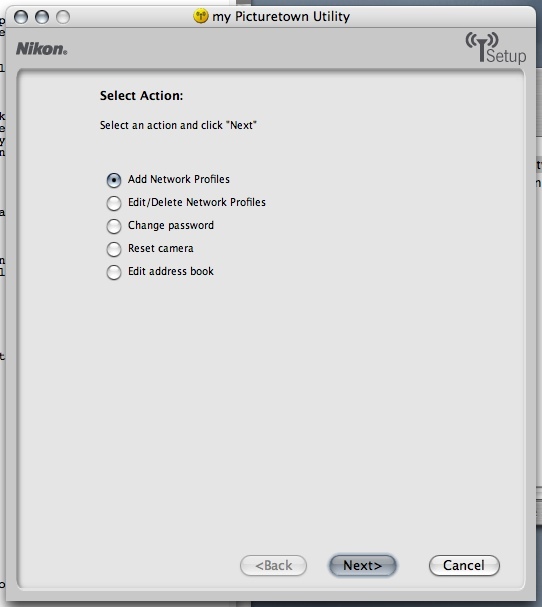 This sequence shows how to enter a network profile in the camera. 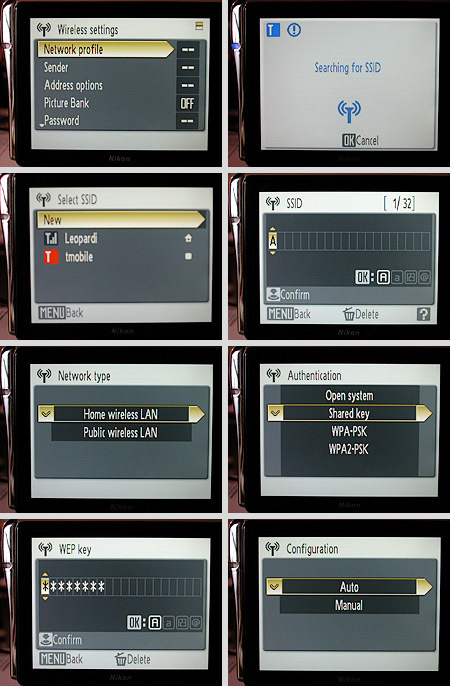 Select Network profile from the Wireless settings menu (top left) and the camera will look for networks. We selected New from the row two left screen and entered the name of our network in the row two right screen using the scroll wheel. Then we identified the network as a Home wireless LAN (row three left) with Shared key authentication (row three right). We entered the WEP key (bottom left) and told it to configure the camera's IP address automatically (bottom right). That simplifies making a connection, which has always been more complex for WiFi than simple pairing is for Bluetooth. All Nikon needs from you to establish an account at my Picturetown is your alias or nickname and your email address, which it refers to as Sender Information. You can enter that right in the camera or using Nikon's wireless utility (with the camera attached to the computer using that USB cable). The scroll wheel method is not bad, actually. The screen displays four key types: caps, lower case, numbers, punctuation. You move from one to the next with the OK key. To select a character, you scroll until it appears in the box on the screen representing its position in the string. Then you press the Shutter button to advance to the next character. You can spin the scroll wheel quickly through the options, so it isn't quite as bad as it sounds, although it is easy to confuse the OK and Shutter button functions. With that stored in your computer, you can transmit your first image to my Picturetown. Just enter Playback mode, press the Mode button, scroll to the WiFi option, Select an image with the OK button, Confirm with the Shutter button, Select Yes to send the picture and your Nikon S51c will look around for a WiFi connection, displaying all the available choices. Transfer. To transfer an image to my Picturetown, you select my Picturetown from the Playback menu (top left) and tag images for transfer with the OK button, confirming the group with the Shutter button (top right). 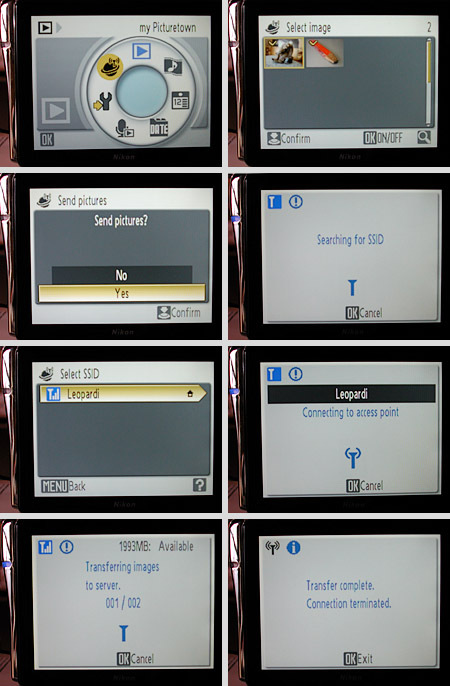 The Nikon S51c asks if you want to send the pictures now (row two left) and when you confirm, it looks for a WiFi network (row two right). In this case it found one (row three left) and connected (row three right). The transfer screen (bottom left) shows we have nearly all of our 2GB server space available as we transfer the first of two images. Note the blue LCD is on. When the transfer is complete (bottom right), WiFi is shut off. The list of available connections is ordered first by profiled connections (ones whose description you've stored with passwords in the camera), then by any others in range, with signal strength indicated with up to four bars. The point of profiling a connection is to save you entering a password. But this isn't a problem with public WiFi access, where there isn't a password. Once the connection has been negotiated, the images you've selected are transmitted to my Picturetown and the S51c disconnects from the WiFi connection, saving battery life. A blue LED on the side of the camera indicates WiFi activity. After your first transmission, Nikon sends you an email to confirm it has received an image from your camera and encourage you to finish registration. "An image has been uploaded from your Wi-Fi camera," the email says. "Your image has been saved temporary in my Picturetown -- photo storage/sharing service run by Nikon. The image is kept temporary until you finish registering with us. Please open the following URL to start your registration." The Web form at that URL will ask you for your camera's Key information (a four digit number you can retrieve by going into Setup, Wireless Settings, Key Information). The form also lets you select a Gold Account (20GB at no charge until March 1, 2008) or a 2GB Free Account, which Nikon estimates will hold about 1,000 2MB images. Our highest quality S51c images ran from 2.5MB to 3.3MB. So the 2GB storage is pretty low, particularly for such an integral service. If, as happened to me, this first setup doesn't seem to work for you when you click the Confirm button, scroll up to the top of the page to look for any error messages in red. I actually had to go back to the my Picturetown email to click on the link again to fill the form out correctly a second time. I must have really confused the server. When I finally got on, I saw the image I had transmitted, but interestingly enough my old Coolpix Connect album was there, too. Nice touch. And the service does let you download the full resolution original, too. my Picturetown. My first transfer in an album of its own with my old S50c album, too. But still, it's Wireless Lite. What if your wireless connection requires a password? You can enter it immediately from the camera using the scroll wheel. And if you want to use the same connection regularly, you can save a profile for that connection in the camera, which can store 10 of them. To do this on your computer (with a real keyboard), install the software from the included CD. We just clicked on the Nikon Standard Install button. In just a few seconds a couple hundred files were copied to our hard disk. Wireless Utility Main Menu. With the Nikon S51c cabled to your computer, you can use a keyboard to do these things. Network Configuration. All on one page, compared to the multi-screen approach in the camera. Address Book. Very easy to enter email addresses. 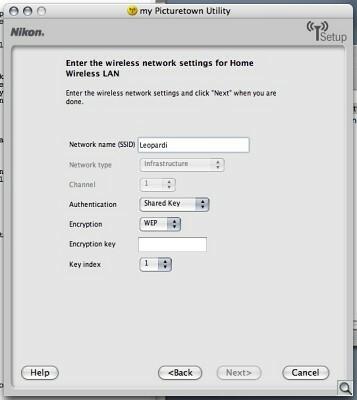 Then cable the camera to the computer using the USB cable and tell the camera about your network using Nikon's Wireless Camera Setup Utility. You have to know what your router's name and its password to play this game. You'll be asked for the Network name, the Authentication Method (Open or free, Shared key/WEP, WPA-PSK or WPA2-PSK), Encryption (which depends on the previous entry), the Encryption Key (or password), the Key Index (for WEP, if necessary), Configuration (Auto or Manual specification of the camera's IP address) and the camera's IP address (if the prior setting is Manual). But, as I said, you really only have to know the Network name and Password. You have to relaunch the utility to add email addresses (including your own). To enter an email address, you enter a nickname (or alias, as Nikon likes to call it) and the full email address. The my Picturetown server can not only store your images but it can also fire off an email to up to 30 recipients with a small thumbnail of any image or set of images you designate. The server notifies them you've "shared photos with you through my Picturetown! Please click on the photos below to view the shared Album." This works just like the Coolpix Connect service. Email. 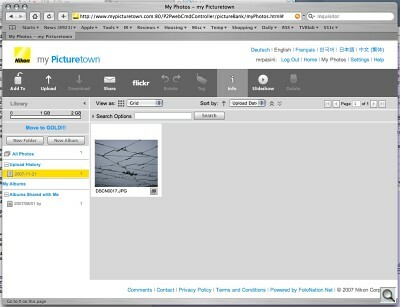 Press the Email button (top left) and you see the last captured image and your email addresses. Click OK to select the image (or scroll to the one you want), then the Shutter button to confirm. Select Yes (top right) to transmit your email request to the server. The Nikon S51c looks for a WiFi network (middle left), connects to the one you select (middle right) and transfers the image if it isn't already on the server (bottom left). When it's done, it turns off WiFi (note the blue LED is off in the bottom right image). Emailing an image isn't on the menu. Instead, you press the little button on the top panel that looks like an envelope. You can do this in Record mode or Playback mode. You'll see the last captured image on the screen. If that's not what you want to send, you can scroll to any other captured image. 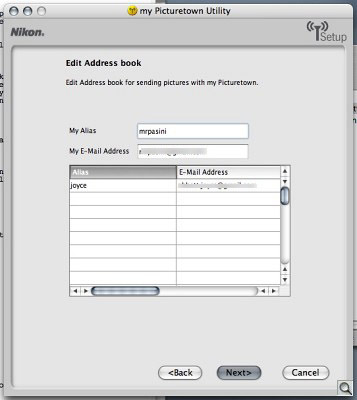 You'll also see some addresses, include New and an option for each email address you've stored in the camera. Click OK to select each address and press the Shutter button to confirm. Detail. Nice detail in these mushrooms. That adds the email command to your queue. You can send right away or wait until you're near a computer. Once you've agreed to transmit, though, the Nikon S51c sends the image to the server (if it isn't already there). And the server does the dirty work. While it all works as advertised, I'm not too impressed with this arrangement. The problem is that my Picturetown is not the bank. The bank, where I safely store all my images as they appreciate in value, is my computer. Yes, I copy the images off my computer to external drives for backup and DVDs and CDs for archival storage, but every image goes through my computer first. That's where it gets rotated, if necessary, and moved to storage. Highlights. No detail in wishbone highlights. 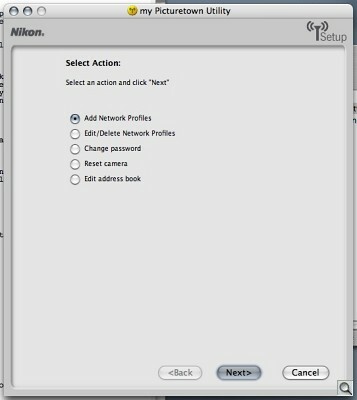 But the Nikon S51c, like the S50c before it, won't let me transmit my images wirelessly to my computer. And it won't let me print them to a wireless printer like the Kodak series 3 printer dock plug or the HP C8180 all-in-one. Kodak, which has to its credit a the WiFi EasyShare One and the Bluetooth V620, recently developed Kodak Picture Upload Technology, Bluetooth technology to grab images off your phone to upload to your computer first and then optionally to EasyShare Gallery. That's how this should be done. I felt foolish cabling this WiFi camera to a computer to get a local copy of the images (and any sound files, which can not be sent to my Picturetown) before deleting them from the card. More than a little foolish, in fact. So should Nikon. Software. If you use the Custom install, you can install Panorama Maker, Nikon Transfer and my Picturetown Utility. These install with separate installers, so be patient. Lens. Internal 3x zoom with image stabilization. Lens. 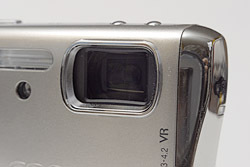 This appears to be the same glass as used in the Nikon S50c, with a 38 to 114mm range and a maximum aperture of f/3.3. Toss in the image stabilization and you can take some interesting natural light shots, particularly nice for shooting infants and children. Zoom Range. 38mm to 114mm to 4x digital zoom. The 3x zoom is a little confining once you've tried something with more range. Don't expect the digital zoom to help much there. It's pretty crude. Color is good but there's little detail in the shots. On the other hand, macro performance is a thrill. You can get quite close to your subject and see things you otherwise wouldn't. The thumbnail of our clay monk is about full size. So the full res image is quite an enlargement. And our carpenter's pencil shots show just how much depth of field you get at f/3.6. The Nikon S51c lens captures some fine detail, too, as our mushroom shot proves. Our test shots show a resolution of about 1,500 lines horizontally and 1,400 vertically, quite good for such a little thing. There is some chromatic aberration at both wide-angle and telephoto, but less than we're used to seeing on a long zoom, say. And there's moderate barrel distortion at wide-angle and some pincushion at telephoto. Finally, there is some vignetting in the corners (they're much darker than the center of the image) at wide-angle. Image Quality. I'm a fan of Nikon color for its natural rendering that does not tease you with oversaturated color. And the Nikon S51c didn't disappoint me there. Macro. Very nice macro performance. The trouble with a JPEG-making digicam, however, is how easily the image processor sacrifices the highlights to concentrate on the rest of the tonal landscape. There was plenty of that in evidence on the Nikon S51c. You can see the same bias in my golf course shot. The sunlight fairways are just burned out, nothing at all like the lush green I saw with my own eyes. But the dark tree trunks have detail -- more than I wanted, really. ISO 1,600. Good detail and accurate color. Noise is another interesting issue with the Nikon S51c. The ISO 1,600 shot of Marti faithfully renders the color and shows quite a bit more detail than I'm used to seeing in ISO 1,600 shots. In fact, the ISO 400 shot bothers me more on both counts than the IS 1,600 shot (because I expect better). Having a usable ISO 1,600, though, is really a treat. The first time I got my hands on an Nikon S51c was in a nightclub. Harsh lighting, very dark faces. But I got good shots. Storage and Battery. There's just 13MB of internal memory in the Nikon S51c, enough to store five normal or three high quality full resolution images in an emergency. So you'll want a large SD card to actually use the camera. A 256MB card holds 115 normal and 60 high quality images. Normal compression is really more than adequate on a Nikon. Considering the awkwardness of the USB cable and the inability of the camera to transfer images wirelessly to your computer, I recommend a SanDisk SD/USB card, an SD card which folds in half to plug into a USB port. It's a great time saver. Nikon claims you can get approximately 150 shots with the Nikon S51c's EN-EL8 battery (up from 130 on the S50c), based on the CIPA standard. That's below average. Unlike other cameras, however, the Nikon S51c has a WiFi drain. So the more you transmit, the shorter your battery life. There's really no need for an AC adapter, although for $20 the compact MH-62 battery charger might be somewhat more convenient than the corded brick included with the camera. 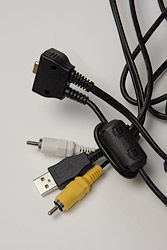 It too includes a long power cord rather than folding plugs, unfortunately. Movie Mode. Using zoom in a Nikon S51c movie is a bad idea. The zoom isn't smooth but abruptly jumps in discreet but large steps, just like the S50c. There are quite a few options in the Nikon S51c's Movie mode, however. They start with high quality 640 x 480 pixel image size at 30 frames per second. A Pictmotion option automatically stops at 60 seconds (as much as Pictmotion can swallow) at 640 x 480 but only 10 fps. A smaller movie size of 320 x 240 and 30 fps comes next, followed by a 160 x 120 and 15 fps size. 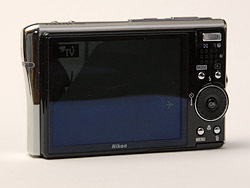 The Nikon S51c also includes a stop-motion option at 5, 10 or 15 fps, but the S50c's time lapse option is gone. Pictmotion. 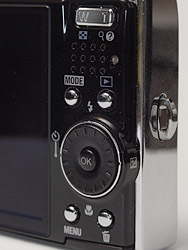 The Nikon S51c has a Pictmotion option in its Playback mode. Pictmotion can create some slick presentations, but it isn't instant. It takes long enough for the program to assemble each show that the Nikon S51c displays a progress bar while the program assembles the presentation. You can save the presentations, too. You do get some sophisticated effects, panning and zooming your images to either the built-in music or tunes you add, all arranged in styles to make it easy to match the mood of your event. Only a few seconds of any movie is used, however (and repetitively, in my case). You can still only transfer Pictmotion shows to a computer using the Windows version of PictureProject, but it's a fun way to show off what you have in your camera. Docked. 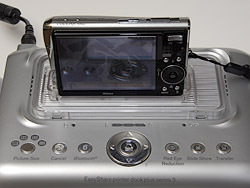 A plastic dock is included for mounting the camera on ImageLink printers. Printing. 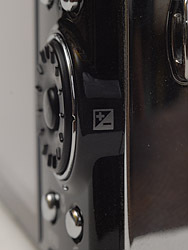 The Nikon S51c can be docked to an ImageLink printer like the Kodak printer dock plus series 3 pictured here. A clear plastic dock insert is included with the Nikon S51c to attach to the printer. There is no USB setup option on the Nikon S51c, which suggests it operates solely in PTP mode rather than Mass Storage. PTP can automatically start image file transfers and control your camera's shutter, zoom, and exposure settings. It's also the required protocol for PictBridge connections to printers, which let you specify how many copies of which images to print. Mass Storage is simple but it's seen its day, useful only on computers that don't support PTP (pre-Windows ME and Mac OS 10.1). 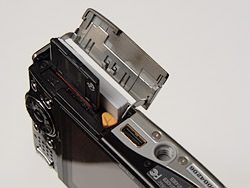 With the Nikon S51c off, you attach it to the dock insert, which has a small USB connector to connect to the camera. 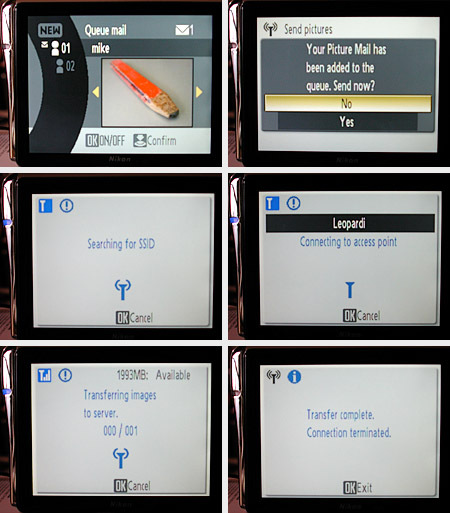 The camera will initialize the printer (as its LCD will explain), and then display the first stored image. Use the arrow keys on the camera to scroll through your images, select them for printing, and set the print options. Appraisal. The Nikon S51c was, in a word, as disappointing as the S50c. Image quality, performance, WiFi capability all left me looking for more, overshadowing the familiar Nikon strengths of a VR lens, D-Lighting, and In-Camera Red-Eye Fix automatically activated with Face Priority autofocus in Portrait mode. Large capacity SD/MMC memory card. These days, 1-2GB is a good tradeoff between cost and capacity. It's beautiful. It's faithful. But it's crippled. The lovely design, among the most striking of all digicams, with WiFi that only talks to Nikon's my Picturetown server, only marginally updates the S50c that preceded it. Take the WiFi issue away (as on the S51) and what do you have? A camera that can't hold a highlight in sunshine and has a less-than-responsive Shutter button. On the plus side, the Nikon S51c has a VR lens, D-Lighting, and In-Camera Red-Eye Fix, all automatically activated by Face Priority autofocus in Portrait mode. The scroll wheel is a pleasure to use, as is Nikon's menu system. The large LCD flatters your images (particularly macro shots) and ISO 1,600 performance is among the best I've seen. The Nikon S50c was a very disappointing revision of one of the most attractive digicam designs ever and the S51c only modestly improves upon it with a larger sensor and slight price decrease.